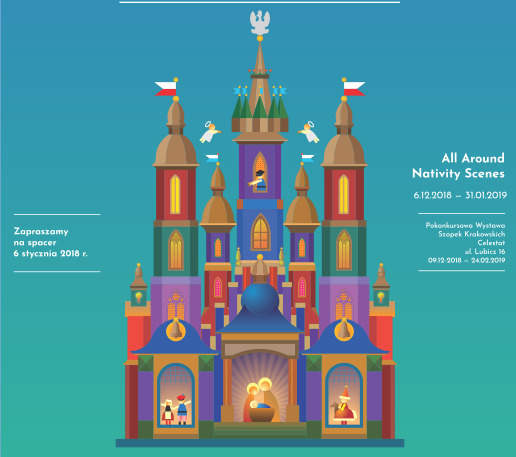 For the fourth time Kraków ushers in winter attired in beautiful festive decorations: the All Around Nativity Scenes campaign prepared by the Historical Museum of the City of Kraków and the Krakow Festival Office (to 31 January) brings specially commissioned nativity scenes into the city space. The collection has been growing over the years, and today it includes fifteen dazzling exhibits. But there’s more: window displays of bookshops, restaurants and shops throughout the city present almost thirty smaller, traditional nativity scenes from the museum’s collections, awarded at previous nativity scene contests. As in previous years, on Epiphany 6 January, Michał Niezabitowski, director of the Historical Museum of the City of Kraków, leads the guided walk All Around Nativity Scenes culminating at the post-contest exhibition at Celestat. The tour sets off at 2pm from the National Archive in Kraków at 16 Sienna Street. The location is no accident: 120 years ago, the building held the Historical Museum of the City of Kraków which has been the patron of the nativity scene tradition since 1946.